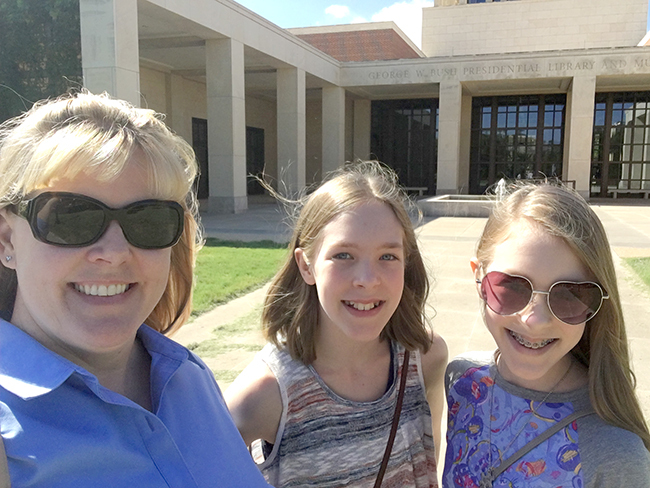 My 13-year-old twin nieces are studying government and economics this year; so, when they were in town a couple of weeks ago, I planned a FUN and educational field trip to the George W. Bush Presidential Library and Museum special exhibit - "First Ladies: Style of Influence." 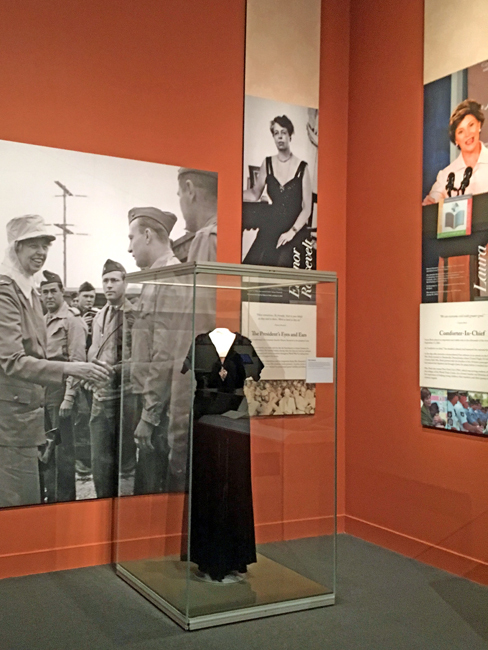 This exhibit "examines how the role of the first lady has evolved over time, and how first ladies have used their position to advance diplomacy and other social, cultural, and political initiatives." The roles were divided into four spheres of influence: hostess, teammate, champion, and policy advocate. 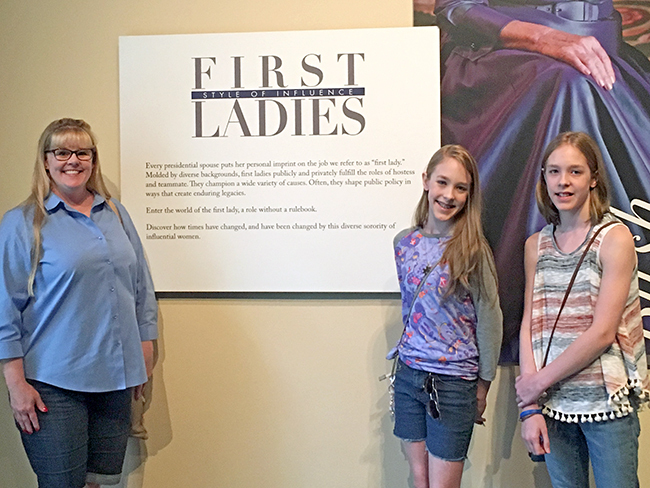 As the girls and I strolled through the exhibit, we learned what each of these roles involves and saw photos, documents, and artifacts highlighting various US First Ladies who excelled in these four areas of influence. 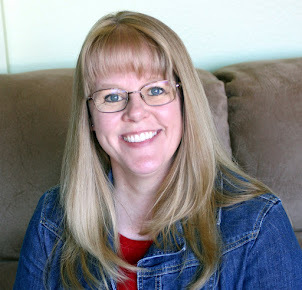 The role of hostess involves coordinating social events and dinners, including creating menus, inviting guests, and coordinating seating arrangements. In this role, first ladies also determine the White House décor and oversee each year's Christmas trees and decorations. 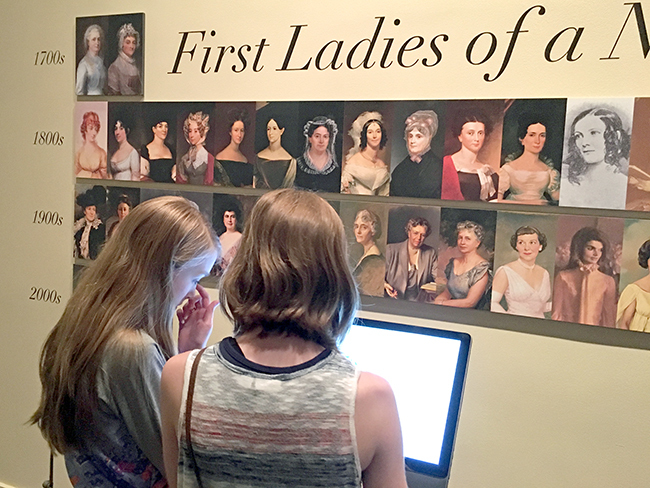 Among the examples in this role, we learned that in 1814, then First Lady Dolley Madison saved George Washington's portrait along with other White House treasures before the British attacked and burned the White House. She understood the importance of these items to our nation and its history. 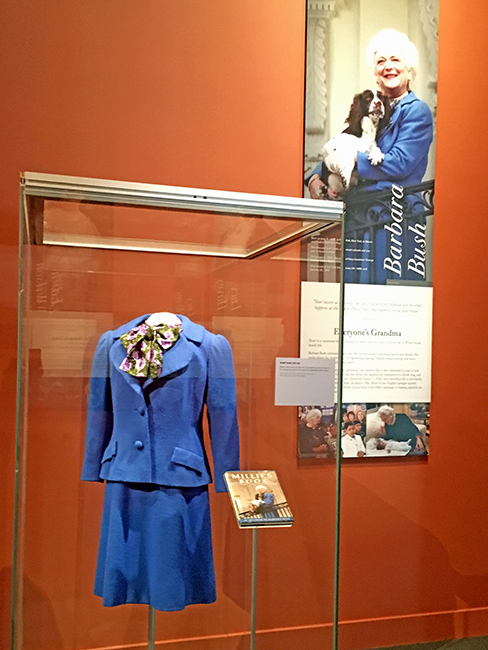 Barbara Bush was another example of a great hostess; she was referred to as "Everyone's Grandma" and is considered one of the most loved first ladies. 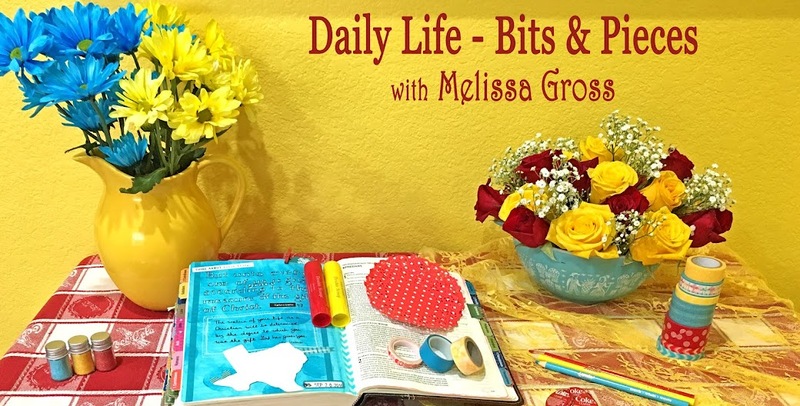 She wrote in her memoir that "...the things that matter are faith, family, and friends." Mrs. Bush passed away earlier this year after living what she referred to as an inordinately blessed life. In the role of teammate, first ladies support and partner with the president. Eleanor Roosevelt, who was first lady for 12 years, 1 month, 1 week, and 1 day, was a huge supporter of her husband during the war years. Likewise, after the September 11, 2001, terrorist attacks, Laura Bush became a comforter and her focus shifted to causes that were tied to the terrorist attacks. The champion role involves a special cause or passion that the first lady is interested in or worried about. For example, both Laura and Barbara Bush were huge champions of literacy. And Michelle Obama spent her time championing good nutrition and movement to fight childhood obesity. 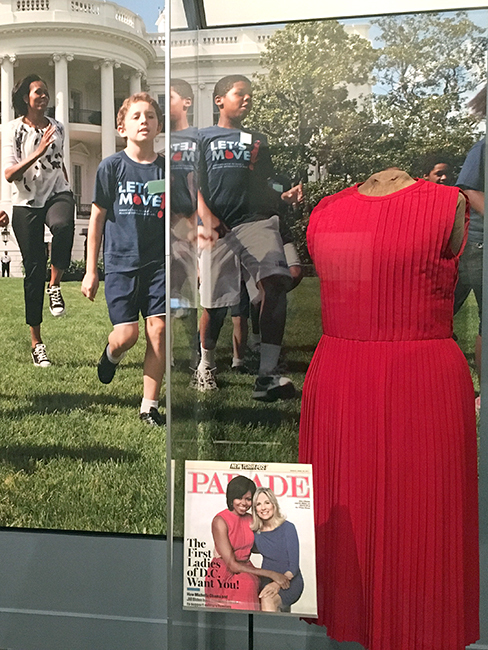 As a policy advocate, first ladies become actively involved in policy creation, breaking down stigmas, and spurring others to action in and out of government. 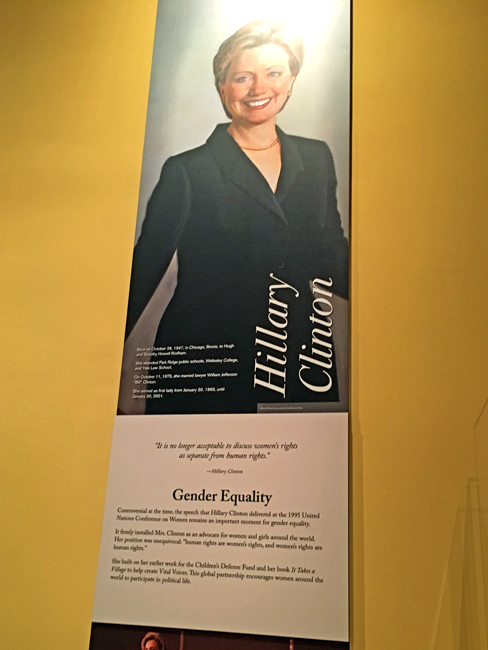 Hillary Clinton is a huge advocate of gender equality and women's rights. We also learned that there have actually been 56 women who have served as first ladies, even though there have only been 45 presidents! This is due to the fact that some president's wives did not accompany them to Washington, thus a daughter or sister might have served as first lady. There were also instances where the first wife of a president passed away and the president remarried. 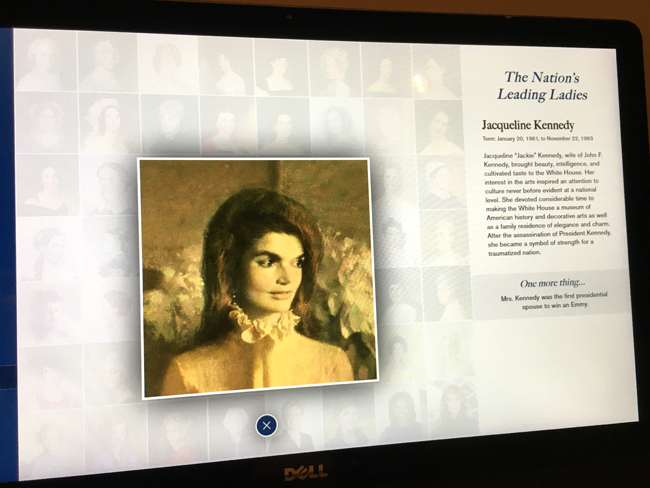 There was a photo and short bio of each first lady on an interactive computer set up at the exhibit. This was a very well-done and educational exhibit, and it was so much FUN to tour it with my nieces, beautiful young ladies discovering their own passions as they grow into women who will influence our world in the years to come! Looks like a great exhibit, and one I would certainly enjoy! We enjoyed that museum last year when we were there. That same exhibit was there. It was a nice follow-up to the Mary Lincoln Todd wardrobe exhibit at Lincoln's Presidential Library in Springfield. Some very stylist ladies - interesting to see the styles change over time.